Dr. Christine Healy graduated from Fairfield University with a Bachelor’s Degree in English with a dual concentration in writing and literature. She spent several years working in finance in New York City prior to returning to complete a Post-Baccalaureate Pre-Med program at Columbia University. Dr. Healy attended medical school at the University Of New England College Of Osteopathic Medicine. She completed her Family Medicine residency at Brown University where she was elected Chief Medical Resident. Dr. Healy spent several years in private practice prior to joining Leonia Medical Associates in 2011. 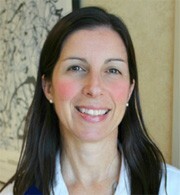 She is Board Certified in Family Medicine and has a particular interest in Women’s Health and Geriatrics.